Accented with the finest fairy sparkle glitter embellishments, this striking card is artistically decorated by hand, just as it was done 100 years ago. Beautifully printed on bright white, satin-finish cardstock, the inside is left blank for your own handwritten message. Vanilla-hue envelope is included. 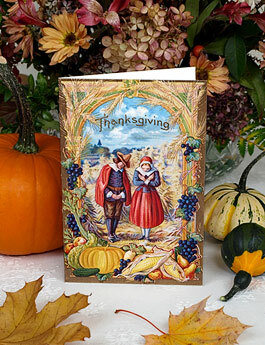 This large card measures 5¼" by 8" and can be mailed with standard postage. Printed in America by a small, family-owned company.